The recommendations set by the IOM for the Recommended Daily Allowance (RDA) and AMDR for protein for different age groups are listed in Table 6.2 “Dietary Reference Intakes for Protein”. A Tolerable Upper Intake Limit for protein has not been set, but it is recommended that you do not exceed the upper end of the AMDR. Source: Dietary Reference Intakes: Macronutrients. Dietary Reference Intakes for Energy, Carbohydrate, Fiber, Fat, Fatty Acids, Cholesterol, Protein, and Amino Acids. Institute of Medicine. September 5, 2002. Accessed September 28, 2017. Simply put, different protein sources differ in their additional components, so it is necessary to pay attention to the whole nutrient “package.” Protein-rich animal-based foods commonly have high amounts of B vitamins, vitamin E, iron, magnesium, and zinc. Seafood often contains healthy fats, and plant sources of protein contain a high amount of fiber. Some animal-based protein-rich foods have an unhealthy amount of saturated fat and cholesterol. When choosing your dietary sources of protein, take note of the other nutrients and also the non-nutrients, such as cholesterol, dyes, and preservatives, in order to make good selections that will benefit your health. For instance, a hamburger patty made from 80 percent lean meat contains 22 grams of protein, 5.7 grams of saturated fat, and 77 milligrams of cholesterol. A burger made from 95 percent lean meat also contains 22 grams of protein, but has 2.3 grams of saturated fat and 60 milligrams of cholesterol. A cup of boiled soybeans contains 29 grams of protein, 2.2 grams of saturated fat, and no cholesterol. For more comparisons of protein-rich foods, see Table 6.3 “Sources of Dietary Protein”. To find out the complete nutrient package of different foods, visit the US Department of Agriculture (USDA) Food Composition Databases. The USDA provides some tips for choosing your dietary protein sources. Their motto is, “Go Lean with Protein”. The overall suggestion is to eat a variety of protein-rich foods to benefit health. The USDA recommends lean meats, such as round steaks, top sirloin, extra lean ground beef, pork loin, and skinless chicken. Additionally, a person should consume 8 ounces of cooked seafood every week (typically as two 4-ounce servings) to assure they are getting the healthy omega-3 fatty acids that have been linked to a lower risk for heart disease. Another tip is choosing to eat dry beans, peas, or soy products as a main dish. Some of the menu choices include chili with kidney and pinto beans, hummus on pita bread, and black bean enchiladas. You could also enjoy nuts in a variety of ways. You can put them on a salad, in a stir-fry, or use them as a topping for steamed vegetables in place of meat or cheese. If you do not eat meat, the USDA has much more information on how to get all the protein you need from a plant-based diet. When choosing the best protein-rich foods to eat, pay attention to the whole nutrient package and remember to select from a variety of protein sources to get all the other essential micronutrients. While protein is contained in a wide variety of foods, it differs in quality. High-quality protein contains all the essential amino acids in the proportions needed by the human body. 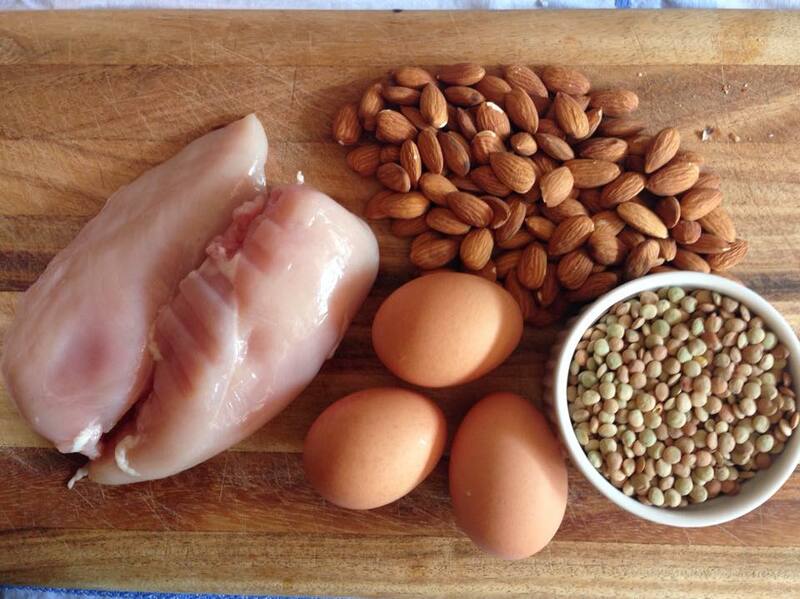 The amino acid profile of different foods is therefore one component of protein quality. Foods that contain some of the essential amino acids are called incomplete protein sources, while those that contain all nine essential amino acids are called complete protein sources, or high-quality protein sources. Foods that are complete protein sources include animal foods such as milk, cheese, eggs, fish, poultry, and meat, and a few plant foods, such as soy and quinoa. The only animal-based protein that is not complete is gelatin, which is made of the protein, collagen. Examples of complete protein sources include soy, dairy products, meat, and seafood. Examples of incomplete protein sources include legumes and corn. Most plant-based foods are deficient in at least one essential amino acid and therefore are incomplete protein sources. For example, grains are usually deficient in the amino acid lysine, and legumes are deficient in methionine or tryptophan. Because grains and legumes are not deficient in the same amino acids they can complement each other in a diet. Incomplete protein foods are called complementary foods because when consumed in tandem they contain all nine essential amino acids at adequate levels. Some examples of complementary protein foods are given in Table 6.4 “Complementing Protein Sources the Vegan Way”. Complementary protein sources do not have to be consumed at the same time—as long as they are consumed within the same day, you will meet your protein needs. The PDCAAS is a method adopted by the US Food and Drug Administration (FDA) to determine a food’s protein quality. It is calculated using a formula that incorporates the total amount of amino acids in the food and the amount of protein in the food that is actually digested by humans. The food’s protein quality is then ranked against the foods highest in protein quality. Milk protein, egg whites, whey, and soy all have a ranking of one, the highest ranking. Other foods’ ranks are listed in Table 6.5 “PDCAAS of Various Foods”. People who follow variations of the vegetarian diet and consume eggs and/or dairy products can meet their protein requirements by consuming adequate amounts of these foods. Vegetarians and vegans can also attain their recommended protein intakes if they give a little more attention to high-quality plant-based protein sources. However, when following a vegetarian diet, the amino acid lysine can be challenging to acquire. Grains, nuts, and seeds are lysine-poor foods, but tofu, soy, quinoa, and pistachios are all good sources of lysine. Following a vegetarian diet and getting the recommended protein intake is also made a little more difficult because the digestibility of plant-based protein sources is lower than the digestibility of animal-based protein. To begin planning a more plant-based diet, start by finding out which types of food you want to eat and in what amounts you should eat them to ensure that you get the protein you need. The Dietary Guidelines Advisory Committee (DGAC) has analyzed how three different, plant-based dietary patterns can meet the recommended dietary guidelines for all nutrients. These diets are analyzed and compared to the more common dietary pattern of Americans, which is referred to as the USDA Base Diet. Table 6.6 “Percentage of “Meat and Beans Group” Components in the USDA Base Diet, and Three Vegetarian Variations” and Table 7.7 “Proportions of Milk Products and Calcium-Fortified Soy Products in the Base USDA Patterns and Three Vegetarian Variations” can be used to help determine what percentage of certain foods to eat when following a different dietary pattern. The percentages of foods in the different groups are the proportions consumed by the population, so that, on average, Americans obtain 44.6 percent of their foods in the meat and beans group from meats. If you choose to follow a lacto-ovo vegetarian diet, the meats, poultry, and fish can be replaced by consuming a higher percentage of soy products, nuts, seeds, dry beans, and peas. As an aside, the DGAC notes that these dietary patterns may not exactly align with the typical diet patterns of people in the United States. However, they do say that they can be adapted as a guide to develop a more plant-based diet that does not significantly affect nutrient adequacy. *The dry beans and peas are in the vegetable food group of the base diet. Source: Vegetarian Food Patterns: Food Pattern Modeling Analysis. US Department of Agriculture. Appendix E-3.3. http://www.cnpp.usda.gov/Publications/DietaryGuidelines/2010/DGAC/Report/AppendixE-3-3-Vegetarian.pdf. Accessed September 28, 2017. From these analyses the DGAC concluded that the plant-based, lacto-ovo vegetarian, and vegan diets do not significantly affect nutrient adequacy. Additionally, the DGAC states that people who choose to obtain proteins solely from plants should include foods fortified with vitamins B12, D, and calcium. Other nutrients of concern may be omega-3 fatty acids and choline. As we age, muscle mass gradually declines. This is a process referred to as sarcopenia. A person is sarcopenic when their amount of muscle tissue is significantly lower than the average value for a healthy person of the same age. A significantly lower muscle mass is associated with weakness, movement disorders, and a generally poor quality of life. It is estimated that about half the US population of men and women above the age of eighty are sarcopenic. A review published in the September 2010 issue of Clinical Intervention in Aging demonstrates that higher intakes (1.2 to 1.5 grams per kilogram of weight per day) of high-quality protein may prevent aging adults from becoming sarcopenic. Currently, the RDA for protein for elderly persons is the same as that for the rest of the adult population, but several clinical trials are ongoing and are focused on determining the amount of protein in the diet that prevents the significant loss of muscle mass specifically in older adults. Nitrogen balance studies suggest that dietary protein intake necessary to support nitrogen balance in endurance athletes ranges from 1.2 to 1.4 grams per kilogram of body weight per day. Recommended protein intakes for strength-trained athletes range from approximately 1.2 to 1.7 grams per kilogram of weight per day. An endurance athlete who weighs 170 pounds should take in 93 to 108 grams of protein per day (170 ÷ 2.2 × 1.2 and 170 ÷ 2.2 × 1.4). On a 3,000-kilocalorie diet, that amount is between 12 and 14 percent of total kilocalories and within the AMDR. There is general scientific agreement that endurance and strength athletes should consume protein from high-quality sources, such as dairy, eggs, lean meats, or soy; however eating an excessive amount of protein at one time does not further stimulate muscle-protein synthesis. Nutrition experts also recommend that athletes consume some protein within one hour after exercise to enhance muscle tissue repair during the recovery phase, but some carbohydrates and water should be consumed as well. The recommended ratio from nutrition experts for exercise-recovery foods is 4 grams of carbohydrates to 1 gram of protein. Branched-chain amino acids, such as leucine, are often touted as a way to build muscle tissue and enhance athletic performance. Despite these marketing claims, a review in the June 2005 issue of The Journal of Nutrition shows that most studies that evaluated a variety of exercise types failed to show any performance-enhancing effects of taking branched-chain amino acids. Moreover, the author of this review claims that high-quality protein foods are a better and cheaper source for branched-chain amino acids and says that a chicken breast (100 grams) contains the equivalent of seven times the amount of branched-chain amino acids as one supplement tablet. This means if you are interested in enhancing exercise performance or building muscle, you do not need to support the $20 billion supplement industry. What about the numerous protein shakes and protein bars on the market? Are they a good source of dietary protein? Do they help you build muscle or lose weight as marketers claim? These are not such a bad idea for an endurance or strength athlete who has little time to fix a nutritious exercise-recovery snack. However, before you ingest any supplement, do your homework. Read the label, be selective, and don’t use them to replace meals, but rather as exercise-recovery snacks now and then. Some protein bars have a high amount of carbohydrates from added sugars and are not actually the best source for protein, especially if you are not an athlete. Protein bars are nutritionally designed to restore carbohydrates and protein after endurance or strength training; therefore they are not good meal replacements. If you want a low-cost alternative after an intense workout, make yourself a peanut butter sandwich on whole-grain bread and add some sliced banana for less than fifty cents. Supermarket and health-food store shelves offer an extraordinary number of high-protein shake mixes. While the carbohydrate count is lower now in some of these products than a few years ago, they still contain added fats and sugars. They also cost, on average, more than two dollars per can. If you want more nutritional bang for your buck, make your own shakes from whole foods. Use the AMDRs for macronutrients as a guide to fill up the blender. Your homemade shake can now replace some of the whole foods on your breakfast, lunch, or dinner plate. Unless you are an endurance or strength athlete and consume commercially sold protein bars and shakes only postexercise, these products are not a good dietary source of protein. Proteins, Diet, and Personal Choices by University of Hawai’i at Mānoa Food Science and Human Nutrition Program is licensed under a Creative Commons Attribution-NonCommercial-ShareAlike 4.0 International License, except where otherwise noted.